Heyo! 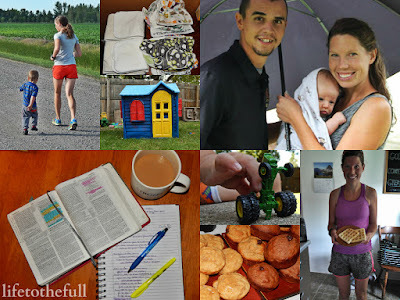 Here begins a new week and another meet up with the Fit Dish link-up and the Faith & Fitness crew! This week, the [optional] Fit Dish topic is to share a "day in the life" photo collection. Not too long ago, I shared a day in my life as a new mom of two. A month has passed since then and our days are developing a little more routine, yet there are always surprises with a toddler and 3-month-old. Dishwashing - We finally got a dishwasher after 3 years of marriage!!! Over the past week, some of our adventures have included going for a family run, eating my husband's famous sourdough waffles, baking a bunch of muffins, painting E's playhouse, camping with family and dancing it up at a wedding. 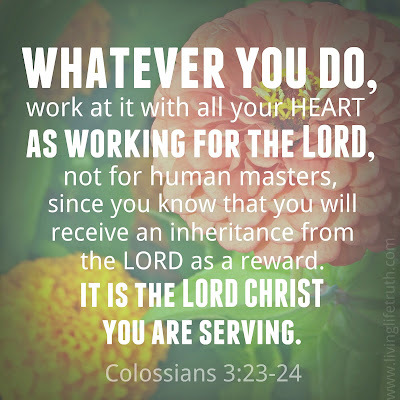 Working at home can feel monotonous with never-ending dishes, diapers and laundry to do, but no matter I'm doing, keeping an eternal perspective motivates me to give it my all. I want to work at it with all of my heart. 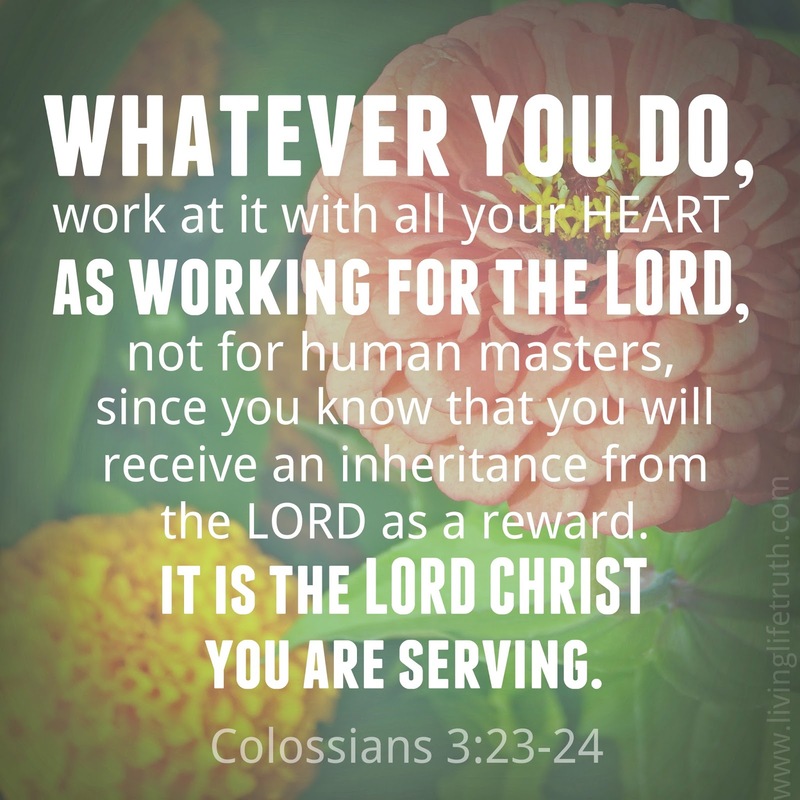 God cares about the work I do - yes, even the mundane daily chores - and it is the Lord Jesus Christ that I am serving. Some times I may feel unappreciated but Jesus sees my heart and my efforts. 8/17 M - Easy: 3.04 miles with the double jogger, 29:00 @ 9:32/mile. Family run with Leo and I taking turns pushing the stroller! 8/19 W - Strength: Pump & Burn DVD. 8/20 H - Tempo Run: 5.5 miles, 45:09 @ 8:12. This run felt hard. Hope I'm not getting sick. 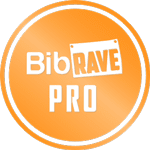 8/21 F - Long Run: 6.2 miles, 52:00 @ 8:19/mile avg. Shorter long run for this week. 8/22 Sa - 3.11 miles with the double stroller, 35:00 @ 11:15/mile. Great visit with my sis-in-law while running! I'm not a fan of pushing the stroller on gravel but it was a great talking pace. 8/23 Su - Off. Wedding dance recovery! What are the "constants" in your daily life? You are so speedy! I wish I was hitting those times in my runs. Great job getting it all done! Great post, Amy! We have similar routines, and I love the quote you shared. You are amazing. And, what a great week of running. Great job fitting in some crosstraining too. And a double stroller on gravel? That's fierce. But, I can understand why you did it. : ) Have a great week! I love it! Whatever you do, do with all your heart! AMEN! If more people would take that attitude what a wonderful place it would be. Enjoy these days - they pass fast! This is a great post! Thanks for linking up with us this week. I think it's so motivating and inspiring to read through other people's interpretation and application of these verses. A day in my life includes: coffee, some form of exercise, a walk with my dogs, dinner and TV with my husband, and, most importantly, I'm trying to incorporate reading my Bible on a more consistent basis.